OxyShred by EHPlabs is the most potent thermogenic fat burner ever developed. It will take your body to a new level of fat burning called “Hyper-lipolysis”. In other words, turbo fat burning. 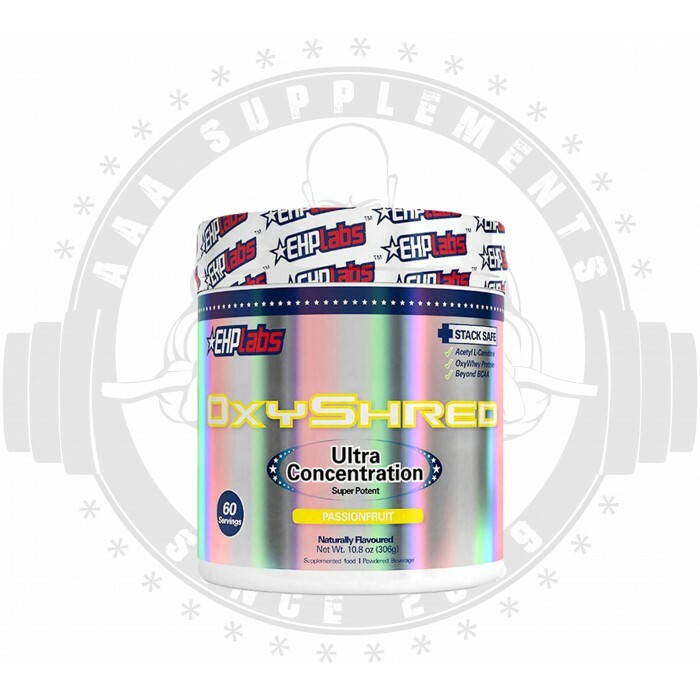 Unlike other fat burners on the market, OxyShred is not a heavy stimulant based thermogenic. OxyShred has been pharmaceutically engineered to switch off your body’s “fat memory” – the a2 receptors and to stimulate your body’s fat burning hormones – the β2-adrenergic receptors to mobilise the existing subcutaneous stubborn fat cells to the mitochondria to be converted into energy in the form of adenosine triphosphate. Burn fat, have more energy, look great, feel happy, love life! Why is OxyShred the Best Thermogenic Ever Developed? Green Coffee Bean Extract: OxyShred is the first super potent thermogenic compound to incorporate Green Coffee Bean Extract. Chlorogenic acid is the active compound in Green Coffee Bean Extract which has been recently proven to work in the intestinal tract to inhibit the absorption of calories in the stomach lining. Green Coffee Bean Extract also works along multiple pathways to reduce body fat and blood glucose levels. Naringin: Naringin is a citrus flavanoid that stimulates the liver to produce important fat burning enzymes. It has also been found to lower lipid levels in the blood and protect the body against certain forms of cancer. The effects of naringin are enhanced in OxyShred by combining caffeine anhydrous. Coleus Forskohlii: The active ingredient in coleus forskohlii is forskolin, which plays an important role in a variety of important cellular functions, including inhibiting histamine release, relaxing muscles, increasing thyroid function, and increasing fat-burning activity. Scientific studies have found that forskolin stimulates the increased production of an enzyme called adenylate cyclase, which increases levels of another enzyme called cAMP (cyclic AMP), which is found in fat cells. cAMP then stimulates another enzyme, hormone sensitive lipase, to burn fat. Additionally, by a similar mechanism using cAMP, forskolin increases thyroid hormone production and release, thereby increasing the body's metabolism, to burn more calories. Phenylalanine: Phenylalanine is a precursor to the amino acid tyrosine, which in turn is needed to produce the hormone thyroxine. Thyroxine is a thyroid hormone that assists in determining the speed of your metabolism. Phenylalanine also stimulates the release of cholecystokinin, a digestive system hormone that produces a feeling of satiety (fullness) after eating and decreases overall appetite, as well as being a precursor molecule for the neurotransmitter norepinephrine, a compound that also plays a role in controlling appetite. Oleuropein: The EHPlabs research scientists identified oleuropein as holding numerous fat loss activating properties. In an animal study conducted, oleuropein raised the thyroid hormone T3 by 2.5 times above the standard levels. In a separate animal study, oleuropein increased noradrenaline and adrenaline secretions, as well as uncoupling protein 1 levels in brown adipose tissue, leading to increased thermogenesis and lipolysis. OxyShred has the ideal dosage of oleuropein for optimal lipolysis. Guggulsterone: Numerous scientific studies have shown that guggulsterone can significantly lower both serum low-density lipoprotein (LDL) cholesterol and triglycerides. This promotes the oxidation of fat cells in the body. Guggulsterone has also been found to be a powerful antioxidant, anti-arthritic, anti-inflammatory, memory enhancing and anti-cancer pharmacological activities. African Wild Mango: EHPlabs scientists conducted a placebo controlled study of African Wild Mango which produced results of increase weight loss and improved blood test results in obese human volunteers when compared with the placebo. African Wild Mango encourages weight loss through the reduction of adipose tissue (white fatty tissue). Octopamine: Octopamine, also known as Norsynephrine, is an extremely strong beta3 adrenergic agonist which stimulates the sympathetic nervous system and encourages the body to burn stubborn fat molecules. Beta3 adrenergic receptors are located in white adipose tissue (fatty tissue), amongst other areas of the body. Octopamine causes these receptors to be stimulated, which causes fatty acids to be released from the adipose tissue and destroyed. 1, 3, 7 Trimethylxanthine: Commonly known as caffeine anhydrous, it is the world's most popular energy supplement to boost your energy levels while dieting and to assist in additional fat metabolisation. It also boosts muscle strength and endurance. Caffeine from guarana, coffee, or green tea is good, but many people find it less effective than the anhydrous form, which has been shown to boost performance in clinical studies. Tyrosine: EHPlabs laboratory and clinical studies have found that tyrosine supports energy production, stamina and focus, without any jittery side effects. The body processes tyrosine as a precursor to producing several important hormones and neurotransmitters, such as epinephrine (adrenaline) and dopamine. DIRECTIONS: Take 1 scoop with 8-10 oz (240-295mL) of cold water first thing in the morning on an empty stomach. On training days, take another 1 scoop with 8-10 oz (240-295mL) of cold water in the afternoon no later than 5pm. Avoid eating food or drinking a protein shake within 20 minutes after consuming OxyShred. DO NOT EXCEED 2 SCOOPS PER DAY.